During summer, many people suffer from dehydration so they tend to consume a drink that replenishes the liquid and required body salts lost from perspiration. Drinking juices in summer has so many benefits; they boost energy, help to overcome fatigue and work wonder to prevent dehydration. Also, they are an excellent source of vitamins, enzymes and minerals. Additionally, they are low in calories and have immune boosting properties. Summer is a great season to enjoy ice-cold, berry-laden milk shakes, old-fashioned lemonade, smoothies and punches. For healthy summer fruit drinks, try to include wide range of fruits as you can, such as raspberries, strawberries, blueberries, red and black currants, etc as these are the excellent sources of restorative nutrients. These easy beverage recipes allow you to chill out and relish sweet 'n' flavorful summer fruits. Juicy grapes, water melons, melting pears and mangoes are all packed with the goodness of summer. Throw the fake chemical concoctions in support of natural cocktails that emphasize wholesome ingredients like fruits, vegetables, coconut water and herbs. The king of the fruits, mango is the hot favorite of summer season. 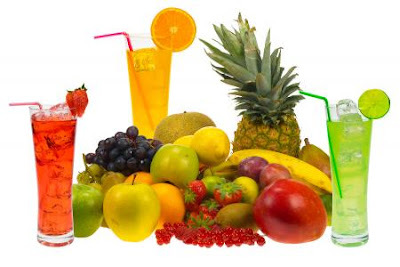 While selecting summer drinks, keep in mind that fresh fruit juices are a hundred times healthier, tastier, and cheaper than colada mixes and bottled aerated drinks. Some ready-made drinks contain dyes, artificial fruit-flavors, high fructose corn syrup, and gums to thicken the drink to a desirable consistency. Thus, it doesn't sound like an energizing way to enjoy a hot summer days. So enjoy these delicious and healthy Summer Fruit Drinks. This simple, healthy and refreshing cocktail of fresh lemon and watermelon provides you about half of your daily required vitamin C.
In a blender, puree lemon and watermelon until it becomes smooth. Then, pour this puree over ice and serve it. Passion fruit is a good source of vitamin C, betacarotene and many natural phytochemicals which provide anti-septic and anti-anxiety effect. Also, antioxidant property of grape juice helps to prevent heart and circulatory disease and premature ageing. Take passion fruits and ladle the pulp out. Then, sieve it to eliminate the pips. Add caster sugar in it and mix until it dissolves completely. After that, add the grape juice. Before serving, leave it in the refrigerator to chill. This natural version beverage gives 3 grams of fiber and 80 % daily requirement of vitamin C. An enzyme, "Bromelain" that present in pineapple may decrease bloating by improving digestion. Combine pineapple chunks and coconut water and then blend it until smooth. Serve this fresh drink in a glass edged with shredded coconut. This natural drink includes cucumbers that contain a mineral named "silica" which may be advantageous for healthy skin, hair and nails. First puree lime, cucumber, honey and water in a blender until it becomes smooth. Then, pour this puree on cluttered fresh mint and crushed ice. Make use of a wooden spoon to crush mint & ice together. Mint leaves can be cut with the rough ice edges and release their flavor. Mangoes are also a rich source of phytonutrients like betacarotene and vitamin A that is essential nutrient for the immune system and skin. First of all peel the mangoes. Blend them through a juicer. Add squeezed lemon juice to it. In a blender, crush the ice and divide it between two glasses. Pour the juice of mango and lemon over crushed ice and serve it. In a blender, mix pomegranate juice, grapefruit (or orange) juice and ice cubes. Blend this mixture until the ice is very finely chopped and it becomes foamy and pale pink. Transfer it to a pitcher and blend in Campari. Pour it over ice, topped with a twist or slice of orange. Note: For preparation of a nonalcoholic version, leave out the Campari and include an extra 1/3 cup of each juice. Not only delicious but also what health benefits it can give is huge. Good collection of Summer Drink recipe is looking really great. Everyone like this drink recipe.